So why all the extra work, we could have just opened a hotel and ran a good quality product. But we are the YMCA, we didn’t open a hotel to run a just a hotel. Young people are at the core of what we, every decision we make as young peoples lives at the core of its values. Blah blah blah… what DOES that really mean!!! Let us tell you Andy’s story…Names not changed to protect the innocent! And became know to us at the age of 14 when he became homeless and was having difficulties fitting in to foster care after being kicked out from home. We took him in to our supported housing at the age of 16, and at 18 We opened the Beach, and Andy showed some interest, a little bit of pot wash, a few ups and down whilst trying to do his level 2 (did we saw a few ups and down… we mean a few pans launched across kitchens a few run ins with senior staff, a few minor scrapes with the thin blue line). But than we had a change of head chef and Paul just “got” him. He started working closely with him and spotted the talent, within weeks he could replicate a dish with over 12 process in. His peaks and troughs started to level, his work improved, his output sored, his confidence grew. 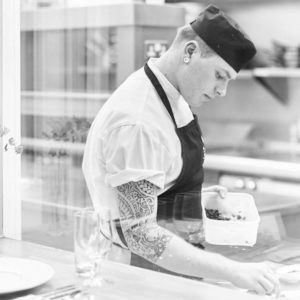 He became a chef, a few more tattoos and a level 3 qualification saw him off to Scotland to work in a 2 rossette Micheline started Kitchen. Where he is now a Head of Pastry. What did it take to get him there… dedication, commitment, trust lots of support and lots of hard work. But every young person we work with we will try our hardest, and when the effort is mirrored amazing results ensue! That’s why we opened a hotel. You are here: Home > Blog > Why we do this.